Disclaimer: This guide is intended to kickstart your knowledge of personal finance. Do not blindly follow the guide below, rather do your own research, think about your situation, and come up with the best plan for yourself. This is meant for educational purposes; I am not a financial advisor. If you liked this post, check out 2 by 22 — my new blog dedicated to helping college students and recent graduates with internship/job recruiting, professional development, and their careers. This post was updated and permanently published here on my blog. By contrast, ~40% of the working population has a college degree — being well educated does not translate to a high net worth. Unfortunately our schools and universities usually do not teach financial literacy, despite its critical importance to a healthy, fulfilling life. A 20 year old who invests $5,000 a year until the age of 65, for a total of $225,000, would end with $120,000 if she put it into a savings account with no interest (value decreases due to inflation), yet $1.5 million if she invested it into a stable portfolio earning ~7% a year in interest. If you instead start at the age of 30, you would end at age 65 with $740,000. If you instead start at the age of 40, you would end at age 65 with $340,000. Just $5,000 a year is enough to be a millionaire if you start now! I believe anyone reading this article has the potential to join the millionaire club by retirement (maybe even the UHNW club). Below is a guide for how to achieve financial freedom and a happy (potentially early) retirement. I made this by consolidating books and articles I read into the most important insights I think everyone should understand. Most of us rely on our jobs for income and have many expenses — things like taxes, rent, food, transportation, leisure, and maybe some savings. If you think about your spending in this order, I challenge you to reverse your thinking. For many of you with your first job offer, it is difficult to understand what your income means relative to how much you need to spend to sustain your lifestyle. Just because you make $100k a year, doesn’t mean you can spend anywhere close to $100k a year. If you make $100k and have a tax rate of 36% and a savings goal of 25%, then your disposable income is only $39k. That’s only $3,250 a month to sustain your lifestyle. Note: This is only a rough estimate. In Step 3 I will show you how to lower your tax rate on a $100k salary to 25% (instead of 36%)— a savings of $13k that can be used for rent, food, and leisure! Notice I calculated monthly disposable income after setting aside money for savings — I paid myself first. If you stick to Fred’s rule of paying yourself first, you will be more financially stable than the vast majority of Americans because it forces you to live within your means! After you save money for yourself and pay taxes, the remaining amount is yours to spend — guilt free. Get that fancy apartment, eat at nice restaurants, do literally whatever you want. Step 2: Figure out how much you should be saving and stick with it! 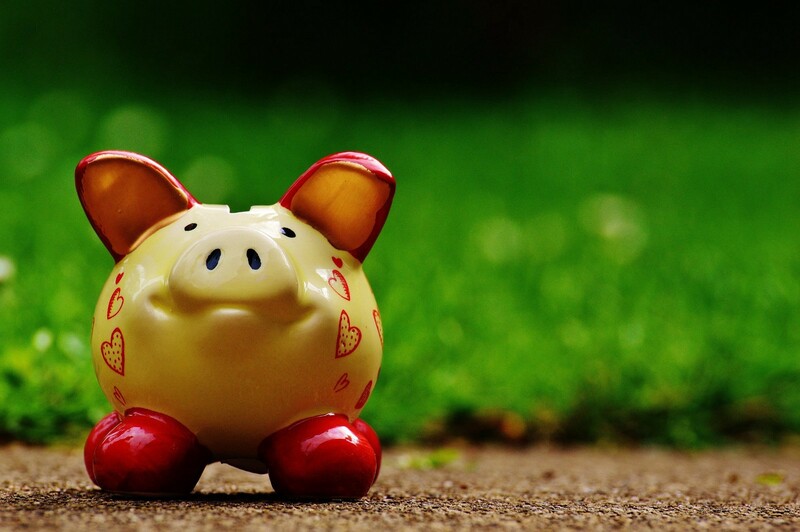 So you’re ready to pay yourself first, but just how much of your salary should you save? The short answer is save between 15% — 40% of your pre-tax salary. The longer answer is it takes a bit of math to calculate a realistic and aspirational savings goal. The key is to balance your savings between your financial goals and your main expenses. Financial goals = Financial independence and retire early, normal retirement, saving for big purchase, etc. Main expenses = Rent, loans/debt, car payment, food, entertainment, etc. So why not save the minimum and sail through life? With investing and financial planning the more you put in the more you get out. One reason to save aggressively is to achieve financial independence and retire early (FIRE). This means you get to retire early (maybe even in your 30’s) and live off the returns from your investment portfolio. Mark Cuban’s goal was to retire in his 30’s. FIRE doesn’t mean you chill on a beach for the last ~40–60 years of your life, rather, it means you get to do whatever you want to do in life without worrying about money. When Mark sold his first company, he made a few million dollars — enough to achieve FIRE. But Mark wasn’t planning to chill on a beach for the rest of his life. Shortly after, he started Broadcast.com with the goal of being the first company to stream audio over the Internet. Unlike his last company, he wanted this one to be worth over a billion dollars. Sure enough, he sold Broadcast.com for $5.7 Billion. Achieving FIRE enabled Mark to further pursue his passions and stop making life decisions because of income needs. FIRE is just one reason for why you would want to save aggressively. While the details of FIRE are out of the scope of this article, I’ve outlined a few of the main philosophies behind choosing your target savings percentage. Whatever your savings goal is — 15% or 40% — just stick with it! Before thinking about the specific investments you want to buy, you need to consider which types of accounts you store your money and investments in. The name of the game is to minimize your taxes. If you put your money in certain accounts, you get to pay less taxes — it’s the government's way of incentivising saving behavior. The wealthy get rich because they know how to use tax laws to their advantage. Remember the example earlier where a $100k salary leaves you with only $39k to spend? That’s because we gave a lot of money to the government in the form of taxes. So how do we reduce how much we pay the government? It’s illegal to hide income from the government, but it’s legal to minimize the income that you are taxed on. The 2 main ways of minimizing your taxable income are through deductions and tax-deferred investment accounts. You have probably seen “deductions” all over the news — they are important but out of the scope of this article as they are usually more applicable as you get older. Here is some information on deductions — see if you can use any of them. Let’s focus on tax-deferred investment accounts. If you make $100k and invest $20k into tax-deferred investment accounts, then you will only be taxed on the remaining $80k. Let’s say at $80k income the tax rate is only 27%. That means you will only pay the government $21.6k (27% * $80k). This is substantially less than the original $30k had you not taken the deductions. Specifically, you get an extra $8.4k to save or spend. If you put that $8.4k annual tax savings into a stable portfolio earning 7%, you will end with $2.6 million by the age of 65. That’s $2.6 million many people don’t get because they don’t know how to use tax-deferred investment accounts like the wealthy. The goal is to minimize your taxable income. Deductions and tax-deferred investment accounts are indispensable to fulfilling this goal — use them to your advantage. 401(k): This is a retirement account you get through your employer (details are always in your offer letter). All money you deposit in this account is deductible from your income before you pay taxes and grows tax-free through investments until retirement. When you retire, you get to withdraw the money and only pay taxes according to your new income. Usually when you are retired your only income will be whatever you withdraw from your 401(k)/other retirement accounts and social security. Therefore your tax bracket is significantly lower than when you are working and generating income. You can put in an annual maximum of $18k + whatever extra your employer matches as part of your offer letter/compensation package. IRA: This is another retirement account that you should set up on your own with a bank. All money you deposit in this account grows tax free through investments until retirement. There are 2 types of IRA accounts: Roth IRA and Traditional IRA. 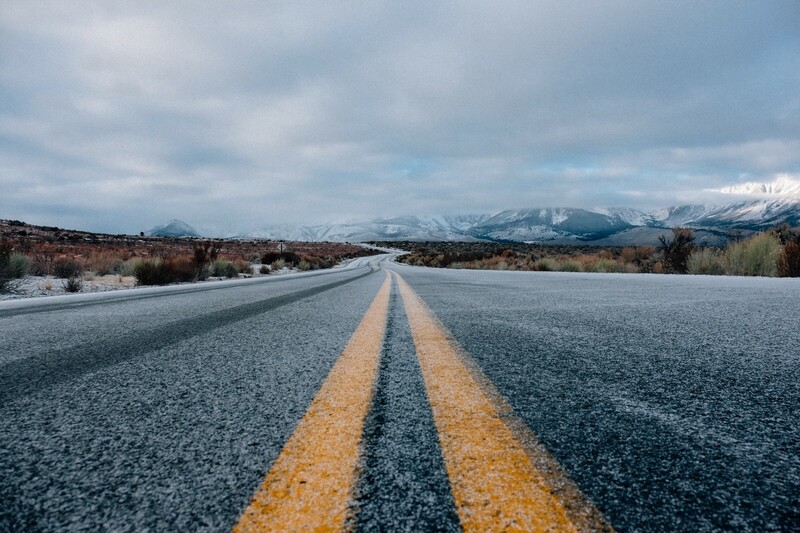 The difference between the 2 accounts is Roth IRA is better if you expect to have a higher annual income when you retire, and a Traditional IRA is better if you expect to have a lower annual income when you retire (compared to now). For most people with high paying jobs, a Traditional IRA is the way to go. Any investments into your Roth IRA, Traditional IRA, or both cannot exceed the annual maximum of $5.5k. 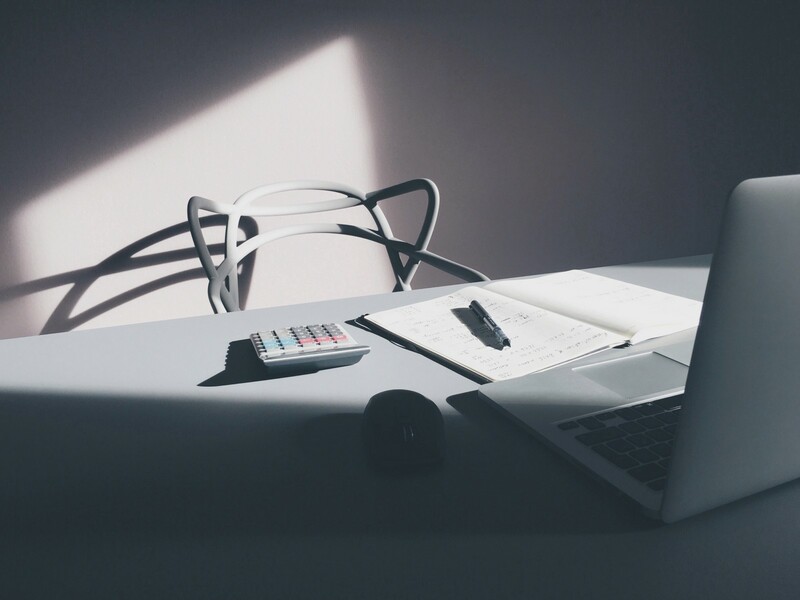 It is worth spending a few hours understanding these 2 tax-deferred accounts. This can make the difference between retiring as a multi-millionaire or not. So now that you are familiar with the main accounts to reduce taxes, where do you put your money? Below is a waterfall chart of specifically where to put your savings. Build an emergency fund: Save 3–6 months living expenses (rent + monthly expenses) and deposit as cash into a standard savings account. Do not invest this money in stocks. You need this to be cash in the case of bad times (recession, lost job, etc). Take advantage of 401(k) employer matching: Most companies give you free money for investing in your 401(k). A good 401(k) matching program gives 50% of up to 6% of your salary. So at $100k salary, the company will give you $3k for free if you invest $6k into your 401(k). This is literally free money, please take it. Pay off high interest debt: If you graduate with students loans or credit card debt that is over a 4% interest rate, pay this off as your next priority. Refer to this reddit post for more detailed guidelines on managing debt. Invest through IRA: Put up to the $5.5k limit into an IRA account of your choice to take advantage of tax-free growth. Top off your 401(k): If you still have money to save (good job! ), go back to your 401(k) and max it out to the $18k limit. In the previous example, we only put in $12k to take advantage of the employer matching of $3k. 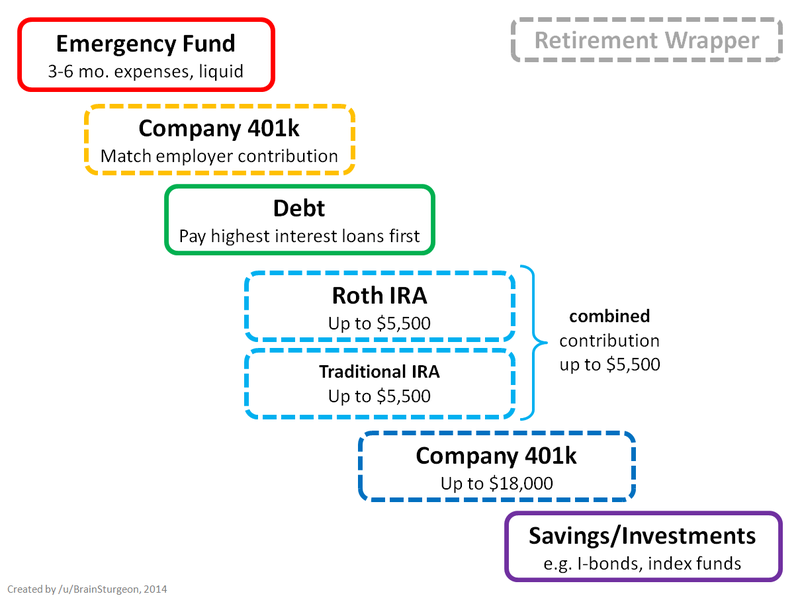 Your employer match does not count towards the $18k limit, so top it off on this step after maxing out your IRA. Invest with taxed money: If you still have money left over for your savings goal, you can invest an infinite amount in a standard portfolio through a stock platform like Robinhood or E-trade. The downside is you are using after-tax dollars to invest. Before you get to this step, make sure you max out all of the tax-advantaged accounts above! If you get this far, I recommend you research some of those advanced methods of reducing your taxable income. Remember: Taxes are your biggest expense in life — reduce your taxable income by investing through tax-deferred accounts and taking other deductions! Step 4: Which specific investments do I buy? A stable, long term (10+ years) investment portfolio relies on investing in ETFs (Exchange-traded funds) rather than individual stocks, bonds, or mutual funds. A stock is a piece of a company — usually you buy stocks in strong companies (Apple, Google, Exon Mobile, GE). If the company performs above expectations the stock goes up in value. A bond is debt from a company or a government. Even Apple and the United States of America have debt, just like student loans, that they use to fund new strategies or government programs. Generally bonds are less risky than stocks. In fact, a 30-year US Treasury bond gives 3% return and is considered risk-free (a word you should never see with any other investment). This is because the likelihood of the US Treasury defaulting and not paying back your bond is deemed virtually impossible. The country would collapse if that happened! A mutual fund is a pool of stocks or bonds that you can invest in without buying the individual stocks or bonds in the pool. For example, a “Large-Cap” mutual fund consists of almost every large company on the stock exchange. Rather than buying 1 share of each company, you can just buy 1 share of the Large Cap mutual fund. Mutual funds are also actively managed — meaning you will be indirectly paying a finance manager to pick which stocks are in the fund. An ETF is a somewhat modern investing instrument. It is the exact same principle as a mutual fund (a pool of stocks or bonds), but the difference is it is not actively managed by someone. Every now and then the pool is updated, but you will not be paying anyone’s salary. 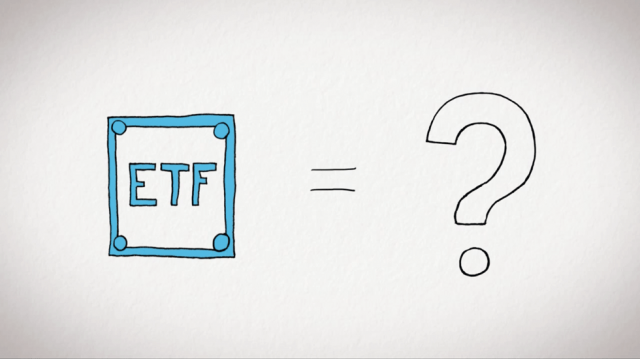 ETF investments are usually better than stocks & bonds, and mutual funds for 2 key reasons. You generally want to avoid individual investments (stocks & bonds) because they are too risky. Instead opt for pools of investments (large cap stocks, international bonds). To invest in pools of stocks, ETFs are usually identical to mutual funds except they have a low expense ratio — meaning you are not paying someone’s salary. Here is more information about why ETFs are cheaper. The key to building a strong portfolio is to choose a good mix of ETF investments and keep your overall expense ratio low. This is a number that is disclosed on every fund you may invest in on Robinhood, E-trade, or any other platform. The lower the expense ratio, the less of your savings are being used to pay for someone’s salary — which is a waste of money. Don’t be fooled by mutual funds that claim 20%+ return over the past “x” years — the past is no indicator of future performance and many of these funds will use your investment to pay high salaries to its managers. I encourage you to do your research on the pros and cons between ETF vs. mutual fund. There are some cases where it makes sense to use a mutual fund, but for now it’s best to stick with the basics when building your portfolio by investing in ETFs and keeping the total expense ratio as low as possible. Now that you know to invest using ETFs, let’s talk about the specific asset allocation. The most influential force behind your portfolio’s stability and performance is the allocation of stocks vs. bonds. Asset allocation is the fancy financial term to describe the percentage breakdown of your portfolio’s investments in stocks, bonds, and cash. Stocks are high return but also high risk (volatility). Bonds are low returns and low risk. When we are younger, we can take more risk with our portfolio and allocate heavily in stocks to get higher returns. But don’t put 100% of your portfolio into stocks (which is what most people who haven’t done their research do). The general rule of thumb is put [110 - your age]% in stocks and the rest in bonds. If you are 20 years old, [110–20] = 90% in stock ETFs and 10% in bond ETFs. Each year as you get older, sell some of your stocks and move that money to bonds so that the percentage allocation changes to 11% bonds and 89% stocks. So why bonds at all? They help balance your portfolio in bad times. During the recession in 2008, a bond index (VBMFX) returned 5%, while a stock index (VTI) returned -37%! Many bonds have close to zero-correlation with stocks. It helps a lot to have a small portion of your portfolio invested in bonds to stabilize the portfolio. When you’re young you want growth, when you’re old you want to preserve your wealth. Therein lies the philosophy underpinning the bond allocation by age rule. Here is a paper by Wealthfront for more information on advanced asset allocation and correlations. Now that we know how much to put into Bond ETFs and Stock ETFs — which specific ETFs do we invest in? There’s a lot of information online about this — here’s an article by Fidelity. Similarly with bonds, there are many different ETFs representing different types of bonds including municipal, corporate, US, and foreign bonds. While it is always worth doing research into the types of stocks & bonds available and the nuances between each type, you can also get away with sticking to the basics. The simple way is to invest in an ETF that automatically balances the pool of stocks or bonds from these different groups. A comprehensive US bond fund is Vanguard’s Total Bond Market Index Fund (VBMFX). This is good for all of your bond allocation and includes a healthy mix of government, corporate, and real estate bonds. A comprehensive US stock market fund is Vanguard’s Total Stock Market Index (VTI). This fund includes many major industries in the US including technology, financial services, healthcare, and more. This is good for 70% of your stock allocation. You don’t want to put all of your stock allocation into this fund because it is limited to domestic stocks. A comprehensive International stock market fund is Vanguard’s Total International Stock Index (VGTSX). This fund mostly represents Europe and Asia, has 15% of its allocation in emerging markets, and the rest is in developed foreign markets. This is good way to get exposure to non-US stocks for 30% of your stock allocation. Note: When combined with the recommended percentages (70–30), these last 2 investments are a strong investment for the stock portion of your portfolio. For example: A 20-year old getting started in investing would put 10% of her investment savings into bonds using VBMFX or a similar fund, and 90% into stocks. The 90% into stocks would be further broken down with the 70-domestic and 30-international allocation. This means 63% (90% * 70%) into VTI and 27% (90% * 30%) into VGTSX . As a check, 63% + 27% = 90% which is total stock allocation for her portfolio. Lastly, these are just suggested funds based off my research. Definitely do your own research before buying any investments. Each year, the value of your stocks and bonds will fluctuate. If your stock ETFs increase by 20% and the bond ETF increases by 1%, your total portfolio value will go up. However, a higher percentage of your portfolio value will now be invested in stocks rather than bonds —this is not in line with your 90% stocks and 10% bonds goal. It is important to rebalance your portfolio once a year. This means selling parts of your portfolio that grew disproportionately from the rest and buying the other parts that didn’t grow as much. Rebalancing will ensure that your portfolio allocation is always in line with your end goal. This is also a convenient time to adjust your stock mix down 1% and bond mix up 1% since you are a year older. But what about buying a stock I believe in — I really think Tesla is going to do well! Secondly, stick with your long term wealth-building strategy. This means do not allocate more than 5% of your portfolio’s total value into any 1 stock and more than 10% of your portfolio’s total value into any specialized sector fund (ie. technology ETF/mutual fund). Furthermore, do not invest in more than a few individual stocks or specialized funds unless you are prepared for the consequences of taking such risk. If you invest a large portion of your portfolio into individual stocks rather than diversified ETF funds, you are no longer a passive investor and are shifting towards other investment philosophies. There are many other investment philosophies worth studying if you are serious about investing. These more time consuming investment philosophies are not required for building wealth and therefore are not covered in this article. There is no fun TV show about passive investing — the key is to build a plan and stick with it. As you can imagine, this doesn’t make for good TV. Alternative investment philosophies and picking stocks are not needed to become a millionaire — stick with a passive portfolio! When investing your money to begin building your portfolio, do not try to time the market. There are many people who think the market will crash soon and many others who think the market is going to stay strong for years to come. If you could predict the market accurately, you could sell your secrets for billions of dollars to hedge funds. For the rest of us, use a technique called dollar cost averaging to reduce the risk that you pay too much for shares. For example, say you have $10,000 to invest right now and shares of an ETF cost $100 each. You would buy 100 shares right now. But what happens if next week the shares drop to $80 each? Over 1 week you just lost $2,000 due to market volatility. Mitigate the risk of volatile markets by splitting your $10,000 investment over a medium time horizon — say 5 months. Each month invest a fixed amount of money, or $2,000 ($10,000/5), into the ETF shares. By doing this, you are averaging the price paid for those ETF shares over 5 months. If markets go up and down, it doesn’t matter as much — you are paying the average. Always use dollar cost averaging when investing a large portion of your savings. The last part of building a strong portfolio is knowing where to put each investment in your tax-deferred accounts. 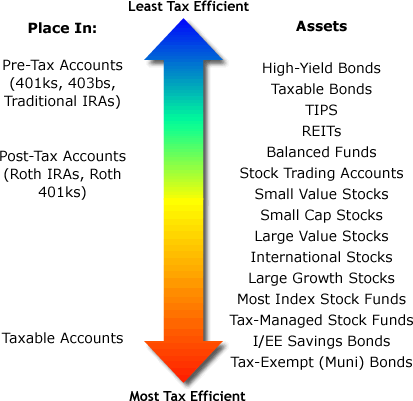 Each investment (bonds, large cap stocks, international stocks) has different levels of tax efficiencies. 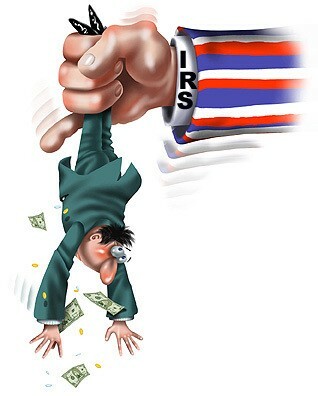 If you are able to put all of your investments into a tax-deferred 401(k) and IRA, great! This will not matter as much. However, you may have money left after maxing out your tax-deferred accounts. In this case, you will have to invest in a normal taxable account. The key is to put the most tax efficient investments into the normal taxable account, and the least tax efficient investments into the tax-deferred account. Here is a ranking of investments from least tax efficient at the top to most tax efficient at the bottom. If someone were to own High-Yield bonds and Tax-Exempt Muni bonds, according to this list, they should put the High-Yield bonds into their 401(k) and the Tax-Exempt Muni Bonds into their normal taxable account. You have a $100,000 portfolio allocated as 50% bonds and 50% stocks. If you put the stock allocation of your portfolio into a taxable account and the bond allocation of your portfolio into your tax-deferred account, after 30 years the value of your portfolio will be $1.2 milion. To withdraw your money you will need to pay taxes, leaving you with $1 million. Alternatively, you invest the same portfolio in the reverse. If you put the stock allocation of your portfolio into a tax-deferred account and the bond allocation of your portfolio into your taxable account, after 30 years the value of your portfolio will be $1.1 milion. After taxes to withdraw the money, you will be left with $885k. While the impact of these tax savings is probably not life changing, it is worth taking the extra effort to understand the tax efficiencies of your investments and place accordingly to maximize long-term gain. The great part about building wealth through passive investing is it rewards inactivity. You don’t need to check your stocks every day and always be up-to-date on market news. The passive investment strategy of buying and holding a portfolio for a long period of time is proven to work, but it is not easy. Being an investor takes discipline — you have to separate emotion and hysteria from your financial decisions. Take a look at what happened in 2008. When the market crashed 30–40%, many Americans saw their 401(k) that they spent decades building lose half its value in just 1 year. In these moments, when everyone in the media is hysterical about the crash and investors are worried, it is crucial to stick with your investment strategy. In fact, in these moments many disciplined investors take advantage of the recession and buy more stock at a discounted price. In late 2008 and early 2009, Apple’s stock dropped from $25 a share to $11. Do you really believe it is possible for the value and future outlook of Apple to be severed in half that quickly, or is there something else going on? Hint: the main culprit is often people’s emotions. Regardless of whether you have the confidence and financial ability to invest more money in a crashing market, you must stick with your investment plan. Do not sell your portfolio and cash out at a huge loss — it will jeopardize your chances of becoming a millionaire. Being an investor is not easy, but spending a small amount of time learning about investing will lead to massive financial gains and stability in life. It is easily one of the highest returns on investment you can get for every hour you put in. And remember, once you develop your plan… always stay the course. Rohan Punamia is a recent graduate of UC Berkeley’s Haas School of Business. Throughout college, Rohan was fascinated by the nuances of internship and job recruiting and often helped his friends navigate their careers. His new blog, 2 by 22, is a continuation of this passion.